We had been due to sail on July 31 2008. It was now August 18, and the last communication we received was the boats would finally pull into the harbor in Larnaca on the 20th, three weeks late. Mary Hughes Thompson was sending out pleas for more money, as our adventure to Gaza was becoming more expensive by the day. People donated their social security checks, their military pensions, part of their pay checks because they believed in us, that we would actually sail to Gaza. The media was calling all the time, the Israelis were spending thousands of shekels trying to find out where the boats were or threatening us by phone that we would never make it. “There’s a bomb on board,” was one call. Another came in late at night, a heavy Israeli accent, “Do you know how to swim?” Lauren Booth, the sister-in-law of Tony Blair was receiving phone calls telling her that her children were in danger. We paid no attention to any of these calls, and we were naïve enough to think Israel would play fair and let two small fishing boats crammed with 44 passengers sail to Gaza. Why not? Israel said Gaza was free, and we were going straight from international waters into the waters of Gaza. What could be easier? The night of August 20, 2008, two tiny boats rounded the corner of Larnaca and limped into port, a bedraggled crew who hadn’t bathed in days making a run for the Sunflower Hotel to stand under the showers, while those of us waiting for them to arrive just wanted to get on board and sail. Everyone was irritated at everyone else; 44 people from 17 countries and a dozen different cultural backgrounds tried to hold a meeting that night to strategize. And we were frightened, even the hardy sailors who had navigated the 1200 miles (1900 kilometers) to get from Greece to Cyprus. And we had the most dangerous 240 miles to go to make it to Gaza. After all, the Israelis had threatened us repeatedly over the past month. Israel was frustrated, because they had been looking for the boats since June. We had written they were in Alexandria, Egypt (and they sent a team there to question port authorities). Then we said they were coming down from different locations in Greece, only we hadn’t posted the correct names on the boats. We knew Israeli commandos had blown up the engines on the Ship of Return in 1988 and murdered three of the Palestinian organizers. But we were determined to set sail and hoped our deception cost the Israeli government money. When passengers finally lined up to get on board the morning of Friday August 22, we were shocked to realize we had to go through passport control. It never occurred to any of us that we actually had to have our passports stamped, since we were leaving the EU for Gaza. The passport control agent, a patient Greek Cypriot, asked us to collect all of the passports and line up until our names were called. A Port Authority officer stood next to him. Twenty-two of us went below deck until we pulled out to the cheers of the people standing on shore. The Cypriot Coast Guard escorted us out and we were on our way. Before we set sail on Friday, the Israeli foreign ministry had warned us to steer clear of the Gaza coastline, and said Gaza was “the subject of an [Israeli Navy] advisory notice,” and we are warning off foreign vessels from the “designated maritime zone”. (It’s important to see that, in August 2008, there was never any talk about a military blockade, legal or illegal). Thirty-three hours on the sea were harrowing, because most of us had no idea how rough the sea would be. And the Israeli military had blocked all our communications, from GPS to sat phones. The two captains were navigating with paper and compass for the entire night, and many people following our trip thought we had been lost at sea. Israel didn’t realize that the last thing we wanted was any kind of a provocation at sea. By this time, the majority of us were sea sick, and the only way we could have driven off Israeli commandos would have been to vomit on them. When we sighted the shores of Gaza that sunny Saturday afternoon, August 23, we realized we had made it. Forty thousand Palestinians were standing at the port, waving and cheering and blowing whistles as our bedraggled passengers and ramshackle boats pulled into port. We were throwing balloons into the water for little boys to grab and stuff down their wet shirts. They were climbing on the sides of the boats, and, for the first time on that trip, we considered the boats might sink with hundreds of Palestinian boys hanging on the edges. The full story of our successful trip and the challenges we met and solved is in this book, Freedom Sailors. It’s 200 pages highlight our quixotic trip and joyful ending. We set a precedent that day, and no amount of Israeli spin over the past 8 years can change the fact that we successfully sailed four more times. “No matter what happens we have already achieved our goal by proving that ordinary citizens with ordinary means can mobilize a defense of human rights for Palestinians,” organizer Paul Larudee told the AFP news agency. “We want people to see the Palestinian problem as one of human rights, not feeding them rice,” he added. 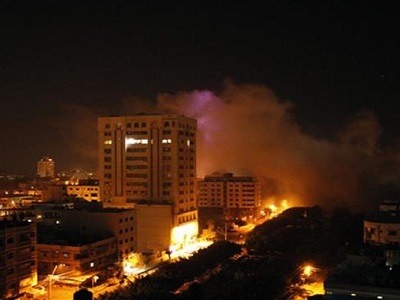 On this 8th anniversary, we would like to remember the passengers and land-crew who have died since then and have written this article as a tribute to them as well as the thousands of Palestinians who have lost their lives in Gaza since that joyous day that changed all of us for the better. Smooth sailing to Sister Ann Montgomery, Hedy Epstein, Vittorio Arrigoni, Scott Kennedy. Thank you courageous Palestinians who cheered us on that day and continued to cheer when we landed in October, November and December of 2008. We have not forgotten the joy we all had, and we will continue to sail until Gaza is free. 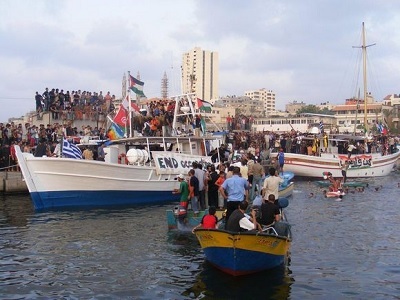 Although no boats have been able to land since December 2008, boats are still attempting to break the illegal siege. As I write this memory, a woman’s boat is getting ready to sail in September. We wish them well. – Greta Berlin is the Co-founder, Free Gaza movement. She contributed this article to PalestineChronicle.com. Thank you Palestine Chronicle for publishing this article. Every year at this time, so many of us who participated in that amazing first trip stop to remember the joy of that day and the promise we made to the Palestinians of Gaza that we would continue to return until Palestine was free. And even though boats have been stopped, boarded, hijacked and passengers wounded and murdered, initiatives are still coming, thanks to the work of the Free Gaza movement. Against all odds, your voyage was victorious. This is a magnificent testimony of the human spirit and how a few determined, remarkably courageous people can transcend the patg for others to see that anything is possible. Always believe in your dreams and NEVER doubt that you can achieve them. Thank you Greta Berlin for sharing this inspirational anniversary story about your voyage. For those of us who participated in this adventure, it is the most memorable event in our lives. 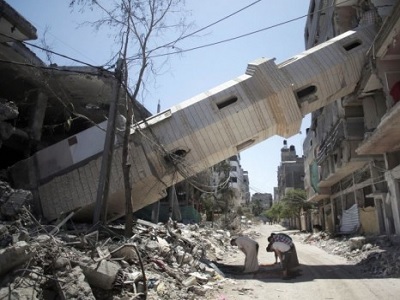 We only hope that the world will wake up and end the ongoing Israeli cruel siege of Gaza.